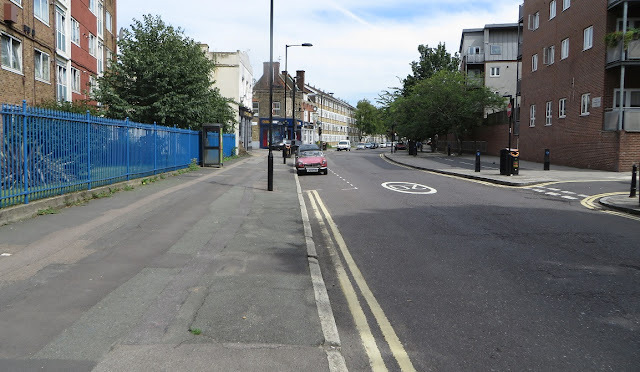 Just over two years ago Hackney Council revealed plans to turn Wick Road into a two way road, as part of their commitment to remove the Victoria Park one way system. 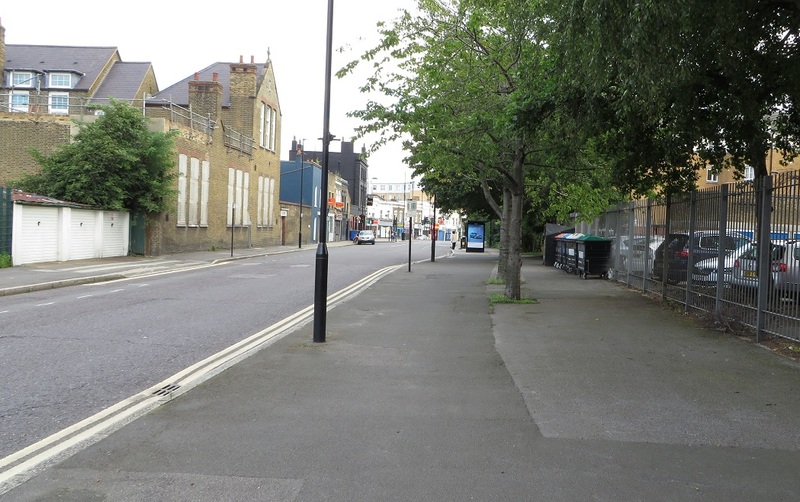 Wick Road is wide, with wide pavements and has only a handful of side roads and shops along it. However, there were no plans in the original consultation to introduce protected space for cycling, even though the road is already used by a high number of buses, lorries and other motor vehicles and making it two way would only increase that number. 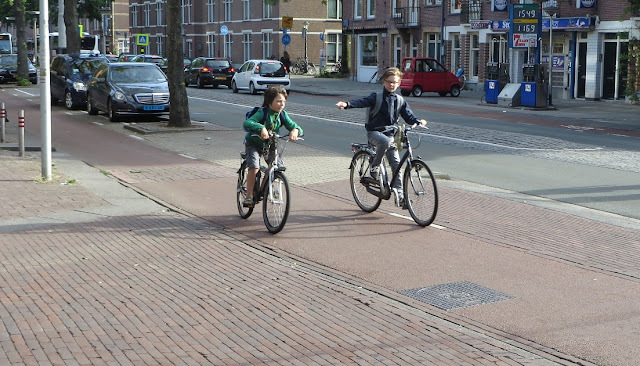 There was even a plan to remove the well used bidirectional cycle track located on the north side of the road and force parents and children who currently use it onto the road instead! Since the consultation closed there has been no mention of this scheme from the council and no consultation report was produced, with just the odd hint that the scheme had been shelved from those close to key people within Hackney Council. 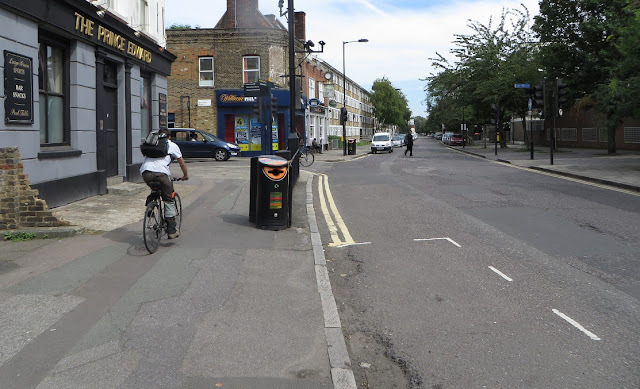 Earlier this year Phillip Glanville, the Mayor of Hackney, confirmed that new plans for Wick Road were on the way with "clear space for cycling" and so now Hackney Council are consulting on Wick Road again. Firstly I want to say how pleased I am to see that Hackney Council listened to the hundreds of local residents who responded to the original consultation to express that these plans were just not good enough. 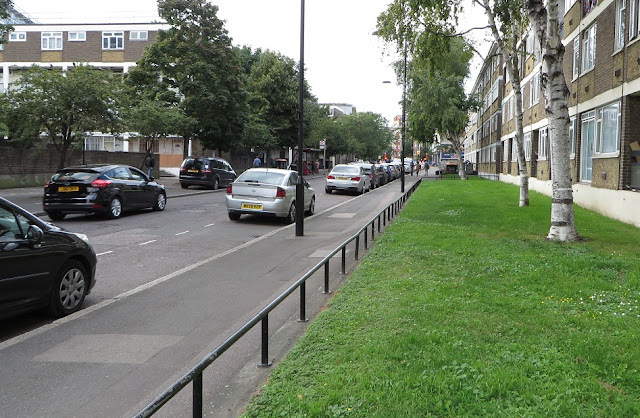 Not only have the council revealed that they now plan for cycle tracks to be built on both sides of the road, they will also retain the popular bidirectional track which forms part of London Cycle Network 8, providing a popular cut through from Homerton towards Victoria Park and Well Street Common. They've also proposed to remove all of the car parking from this road, apart from some footway parking which is to be retained. After a number of poor street schemes in recent years it is really exciting to see these plans from the council and to think that later this year they could be reconstructing Wick Road with cycle tracks, allowing anyone, no matter what their age or ability, to cycle along here. Whilst the main consultation page promises "cycle tracks" here, the PDF plan of works linked to from there describes them as "proposed footway cycle lanes". 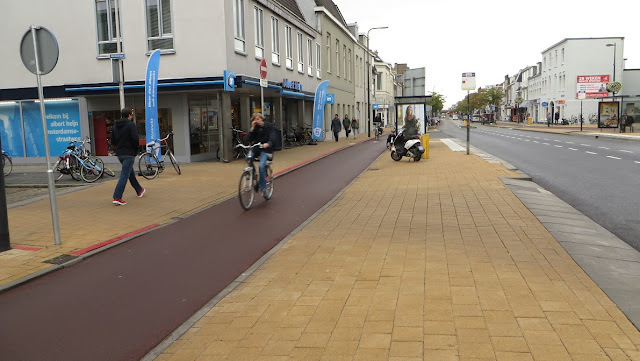 It is important not to think of this as a scheme where people are "cycling on the pavement" and so the Council need to make clear throughout that these are cycle tracks, not pavement cycle lanes. A cycle track, located between a pavement and a roadway. They are three different things. 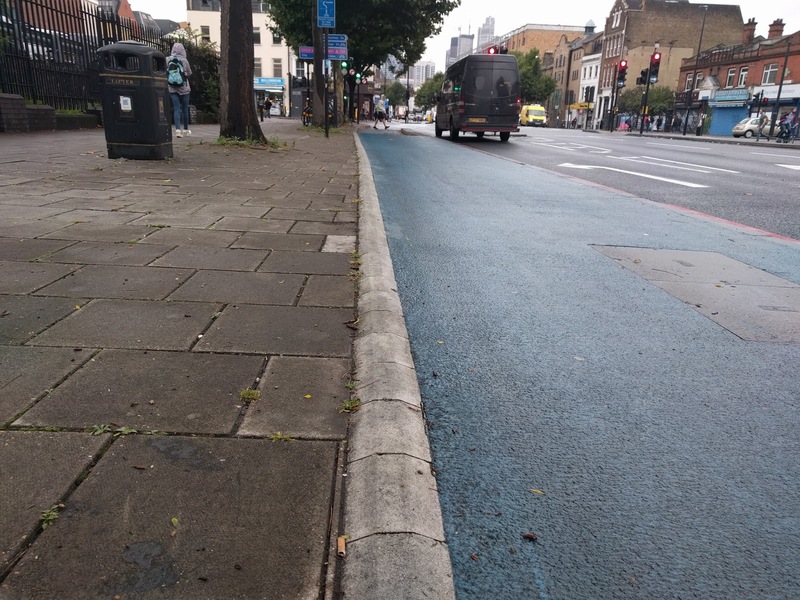 There were also no details of how wide the cycle tracks were planned to be until the council confirmed on twitter that they would be 1.5 metres wide on both sides of the road. This information was then added on to this page, along with some additional information that was not contained in the consultation. Thankfully this confirmed that the footway and cycle track would be distinct and separated from each other. 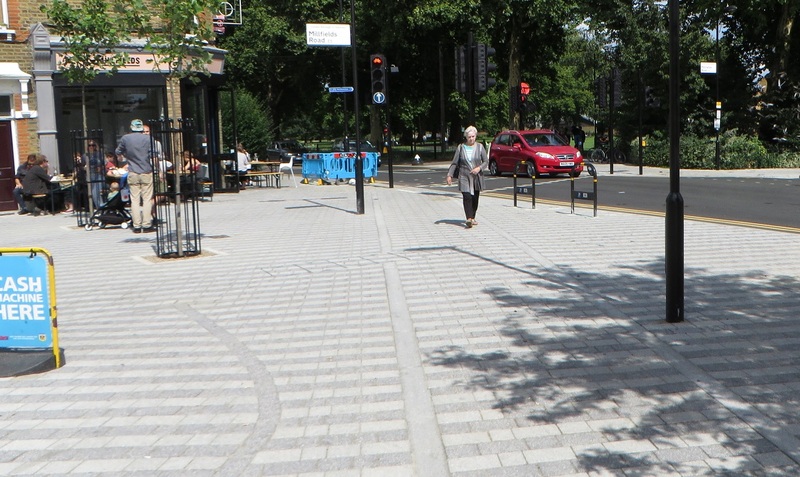 The Council is considering the option that would be the most effective for pedestrians, particularly for the benefit of blind and partially sighted people. Great news that the Council are considering the needs of pedestrians and recognise the need to reduce the risk of conflict between those walking and cycling. 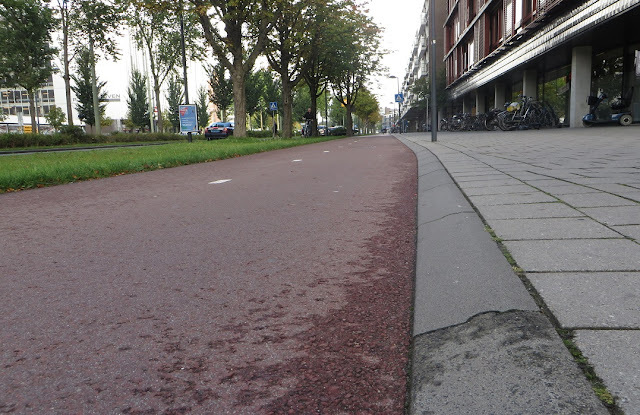 If a stepped kerb is to be introduced (and this would be my preferred option) than low angled kerbs should be used to maximise the width of the cycle track, allowing cyclists to travel closer to them without the risk of catching their pedals on the kerb. It is important to also consider what is effective for cyclists, not just pedestrians. 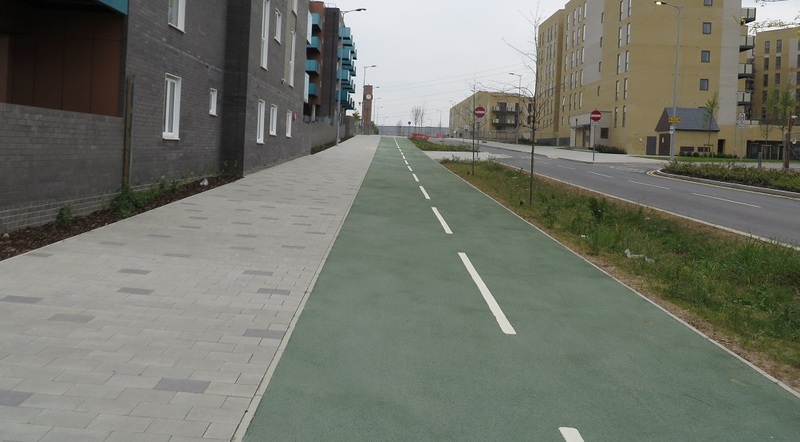 A recently built cycle track in Barking Riverside, about six miles from Wick Road, as smooth as any cycle track I have cycled on in the Netherlands. We can do it! 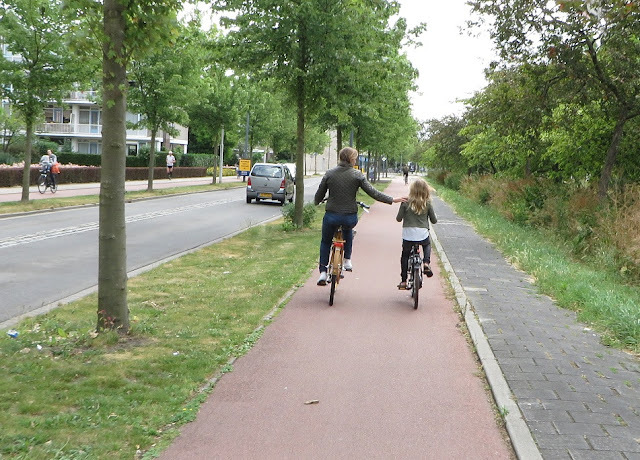 When cycle tracks are 2 metres wide, with forgiving kerbs, it's possible for people to ride side by side and to overtake slower cyclists. 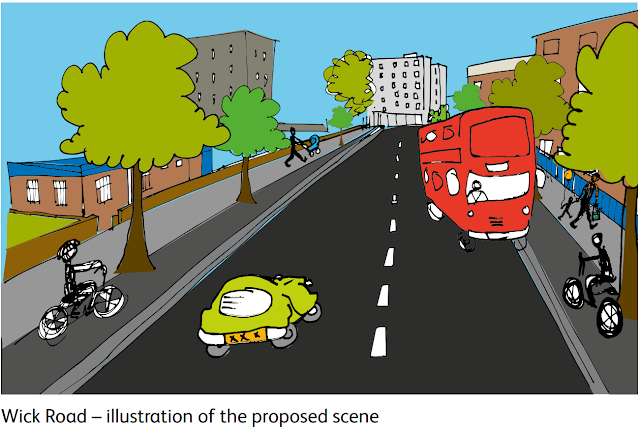 Quite a cute kiddie picture but lets hope we don't end up with a road that wide, buses careering into cyclists and trees in the cycle track like we have on the CS1 cycle track in Shoreditch! 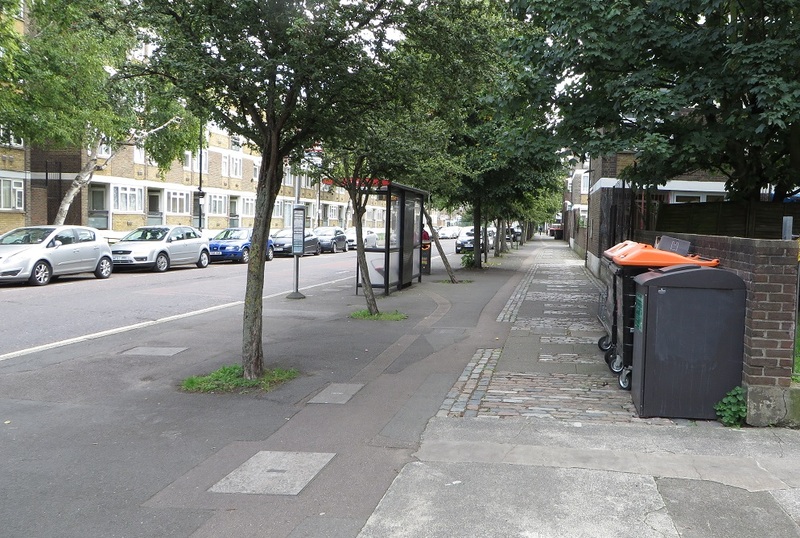 The westbound cycle track begins just before the bus stop and directs people cycling round the back of it, but then pauses as it becomes a "proposed shared space"
Some street schemes from Hackney Council that have been built recently include raised tables at junctions, as proposed here, but the issue with this design is that it continues to appear as though motor traffic turning into or out of the side road have priority over people walking (or cycling on the shared pavement, in this case) and it is they who must give way. I'm also not convinced they work that well at slowing traffic down. 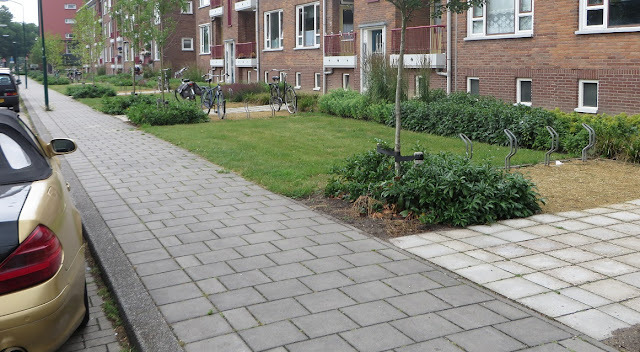 Could something like this example from Amsterdam be constructed here instead? 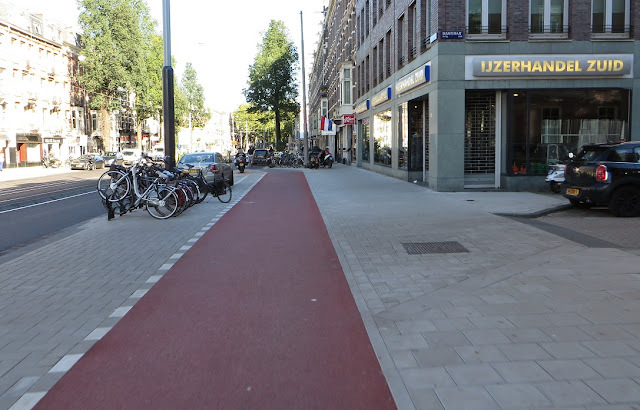 This is a much better solution as the tight corners and impression that people walking and cycling have priority really do slow down traffic coming into or out of the side road. As I stood here last week quite a few vehicles did a left turn into Hedger's Grove, including a lorry at one point, so perhaps filtering of roads in the cell between Wick Road, Cassland Road and Kenton Road should also be proposed to ensure all the roads here are access only for residents with no through traffic? This could also be achieved by opposing one way systems, such as by making Hedger's Grove one way here for motor traffic but two way for people walking and cycling, further reducing the risk of any collisions at this junction. 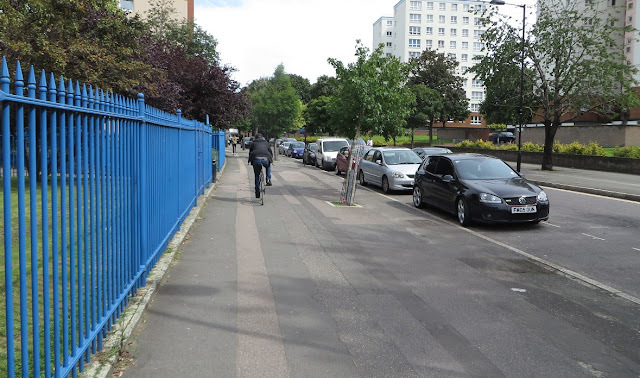 The cycle track resumes again after Hedgers' Grove but this is the section where the footway parking remains and so the pavement and cycle track will both run behind the trees. 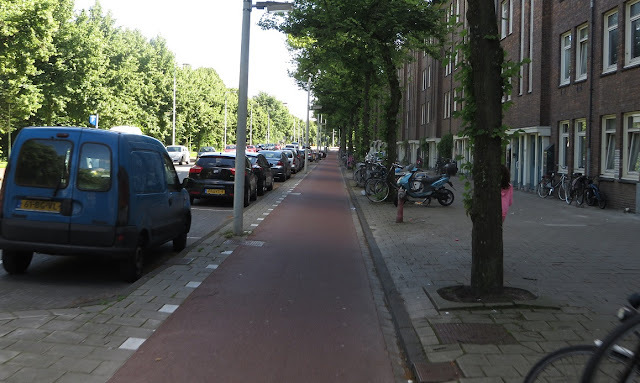 I measured this section and it is about 4 metres wide from wall to tree so there is space for 2m cycle track and 2m footway, which should be adequate. 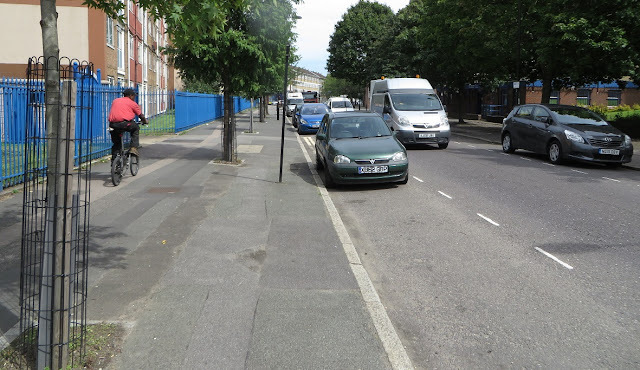 This elderly gentleman is cycling away from the Doctors Surgery, the correct way but still using the footpath rather than the road, as many people do already on Wick Road. 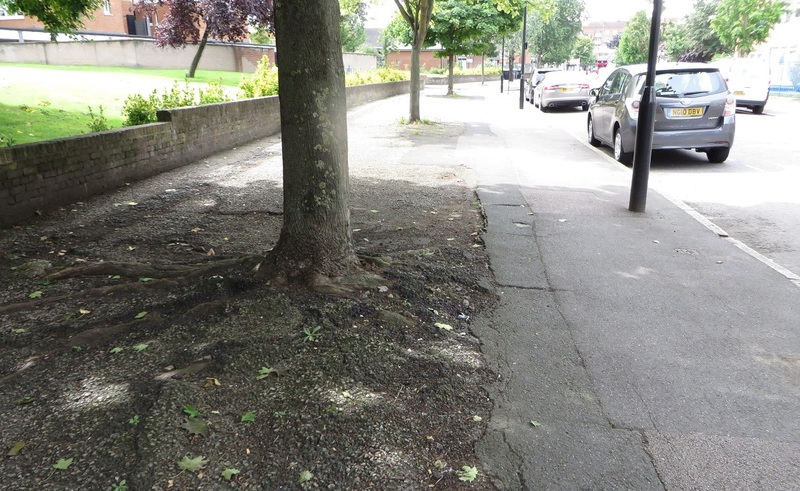 The pavement either side of Bradstock Road is planned to be shared space with Bradstock Road cutting through the footway. As with Hedger's Grove a much better arrangement is for a continuous footway and cycle track past here, as it become single direction again. 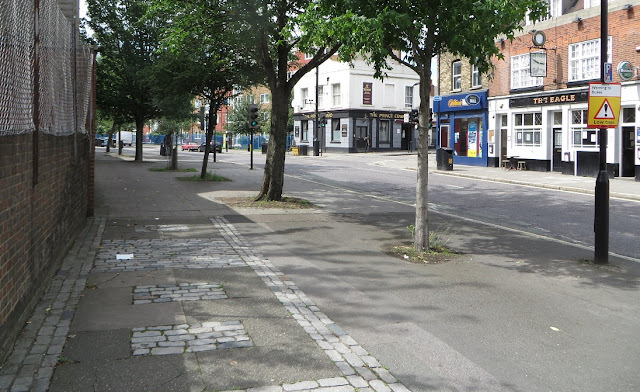 Car parking is to be removed west of this junction, it is difficult to tell from the document but it does look like the footway and cycle track area is to be widened slightly. The current space between the tree and the beginning of the parking is 3.5 metres. 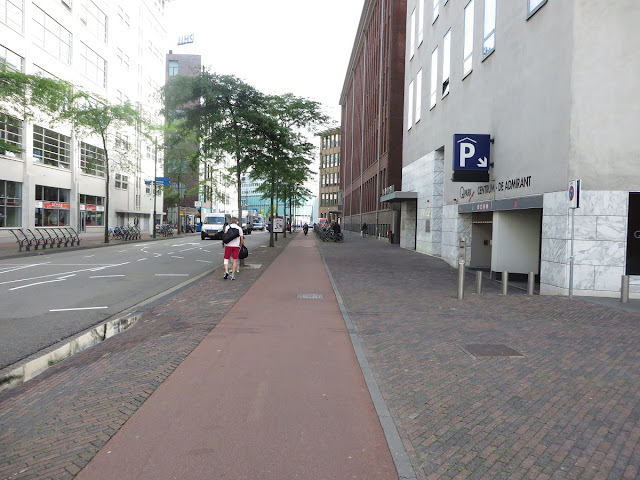 Access into a public car park over the footway and cycle track in Eindhoven. As a cyclist or pedestrian you can hardly notice it is even there. 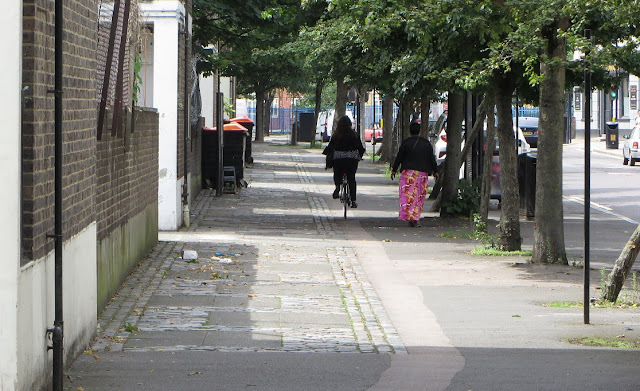 Followed by another estate road that only leads to six garages, one of which has been converted to a cycle store. 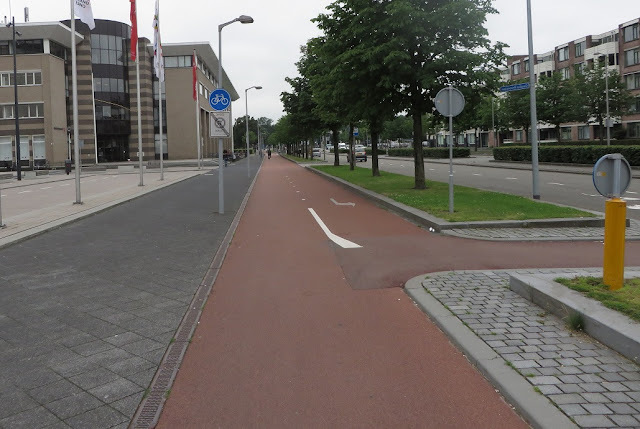 At the end of the road the cycle track veers back to the road to become a cycle lane leading into an ASL. In my view the cycle track should continue to the end and then cross over Kenton Road alongside the pedestrian crossing. 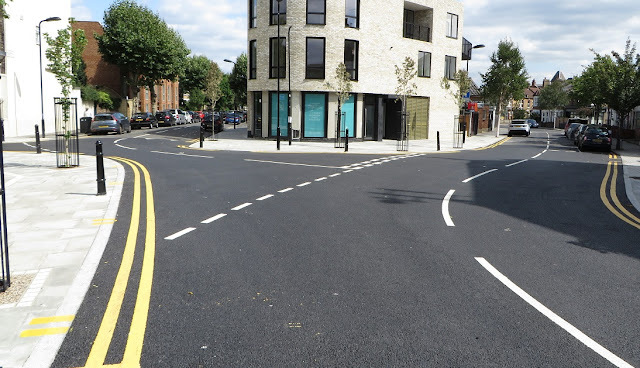 If contraflow cycling could be allowed on Well Street then the options could be to continue into Well Street or turn right onto Morning Lane, without having to worry about left turning motor traffic, with no need for an ASL. I really don't understand the reason behind this at all. The pavement is already wide enough and there is a large grassed area behind it. 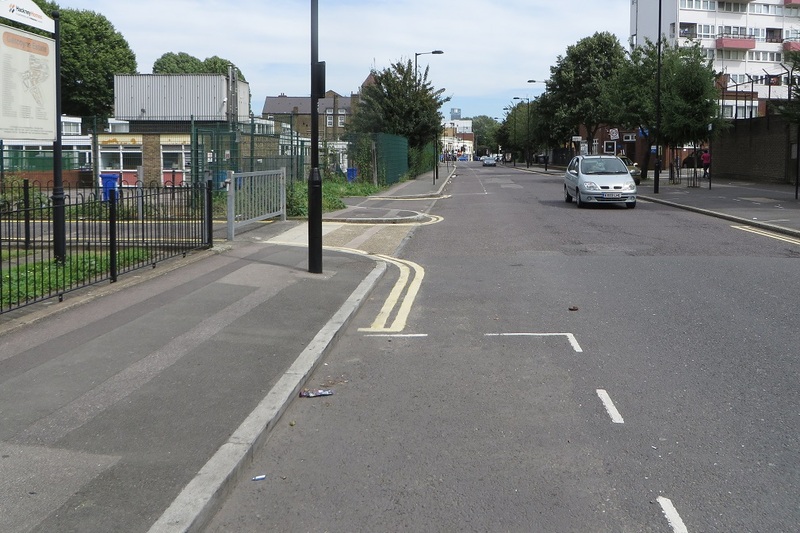 Why not use some of this space to create a left turning cycle track from Morning Lane into Wick Road that bypasses the traffic lights? 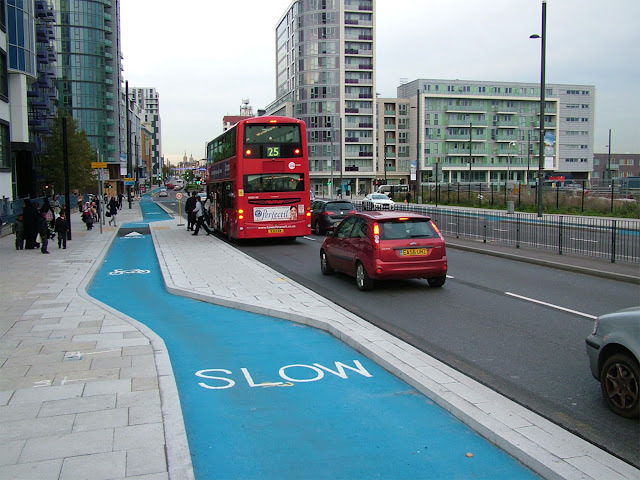 People cycling are expected to cycle up the inside of buses and lorries to reach an ASL at the traffic lights, risking their life to do so, whilst an extended pavement is built to the left. 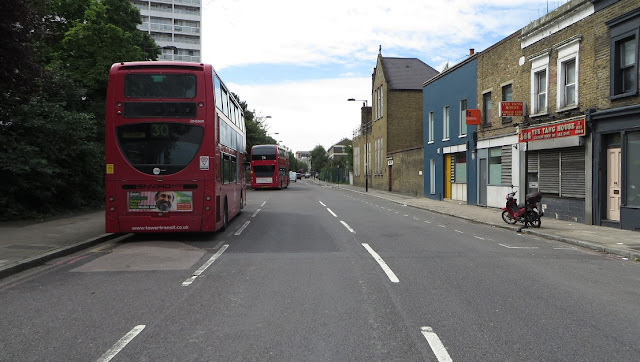 Once Wick Road becomes two way it is very quickly going to become a very popular route for lorries travelling from Hackney Central, Dalston and beyond to quickly reach the A12. 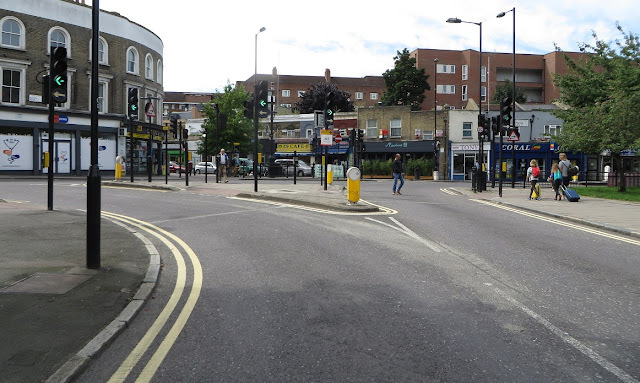 Mixing cycles and left turning lorries at these traffic lights could result in fatalities. As this junction is being completely remodelled there really is no excuse not to have a cycle bypass. 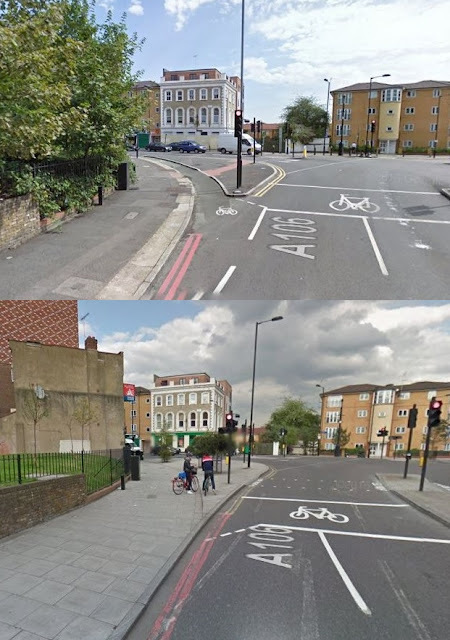 A cycle bypass of the traffic lights at the other end of Wick Road, removed by Hackney Council in 2012. Travelling East from this end of Wick Road there is just a cycle symbol on the road past Flanders Way. 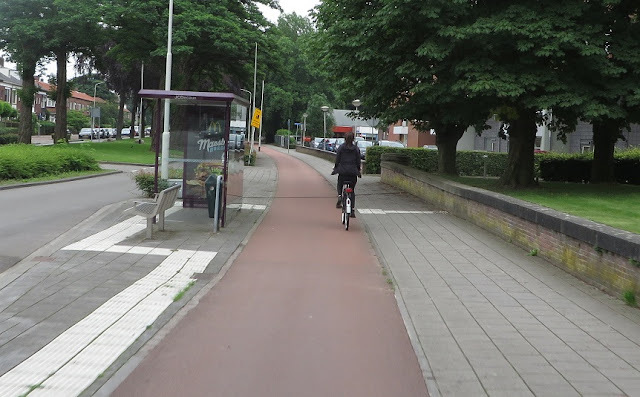 If a cycle bypass were to be built at the traffic lights then it might be possible to run a cycle track past Flanders Way, set back from the carriageway. 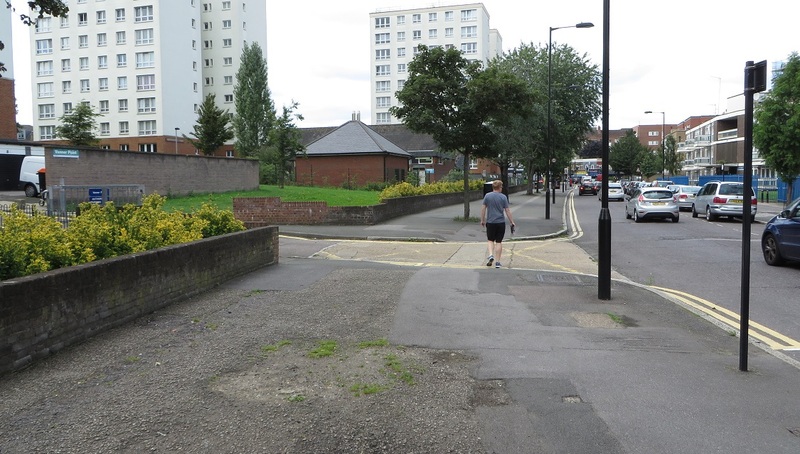 Alternatively perhaps Flanders Way could be closed at Wick Road as it can still be accessed from Morning Lane nearby? 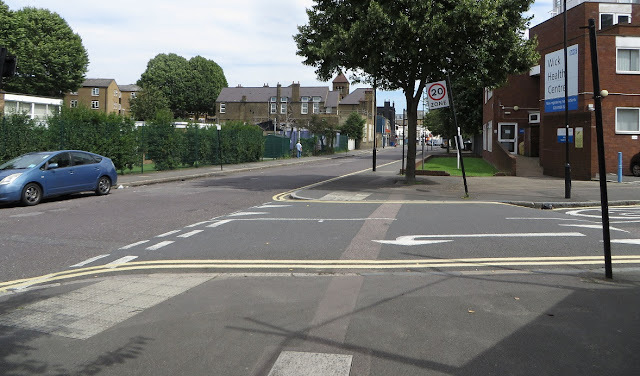 This would certainly make the road safer for local children travelling to Berger Primary school and I also worry that once Wick Road turns two way Flanders Way may be used as a shortcut from Morning Lane to Wick Road, by motor traffic bypassing the traffic lights. At the Barnabas Road junction the cycle lane ends and becomes an ASL. 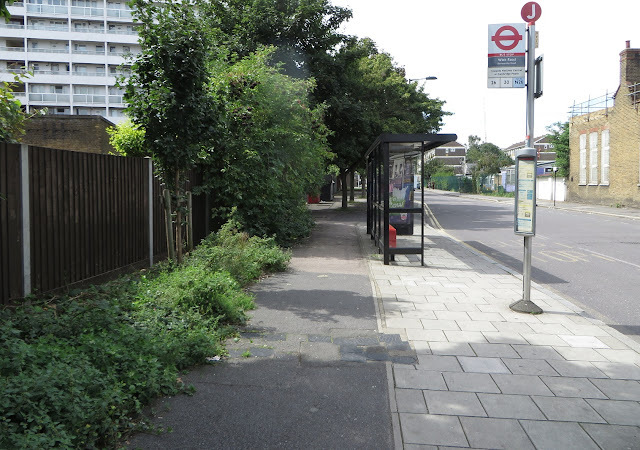 Could some of the grassed area be cut back to create a floating bus stop, cycle track and footway? 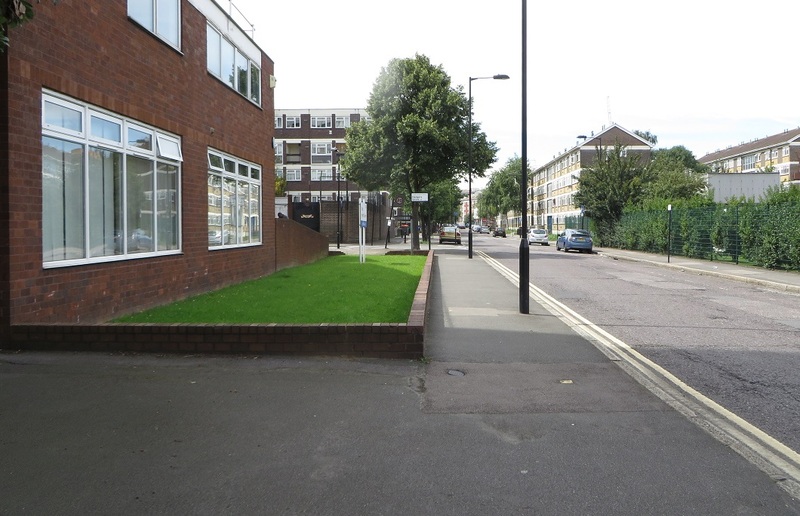 Perhaps a good opportunity to spruce up the grassed area with additional plants and perhaps some cycle parking? 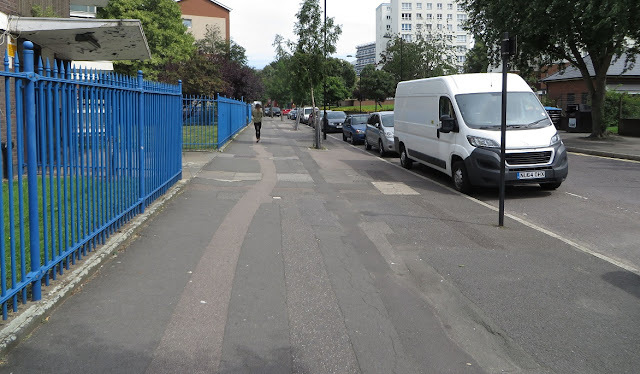 Again I think a continuous cycle track and footway should be built here, especially as the consultation states that they want Wick Road to be "More pleasant for people to walk and cycle, including pupils, parents and teachers at St Dominic’s Primary School". 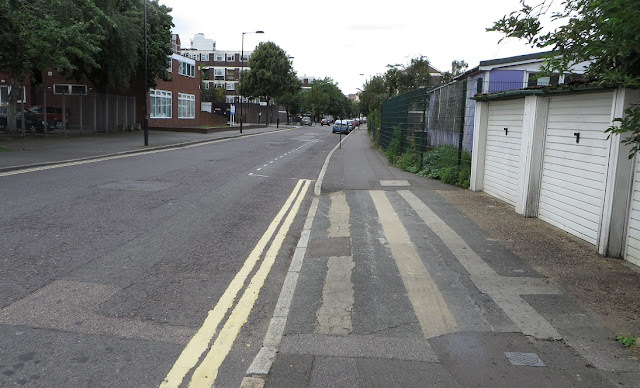 where it then turns back to a painted cycle lane past the garage entrances and onto the end of Wick Road with a "proposed loading bay" within the cycle lane. 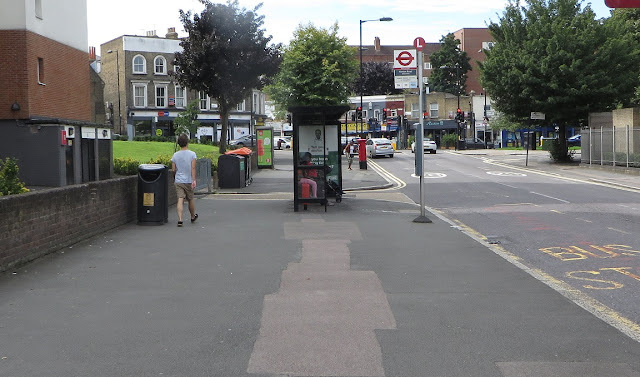 Here the bus stop cannot be in the carriageway as traffic will back up into the junction behind and so there isn't the space for two vehicle lanes, one bus stop, one loading bay, two pavements and two cycle tracks. 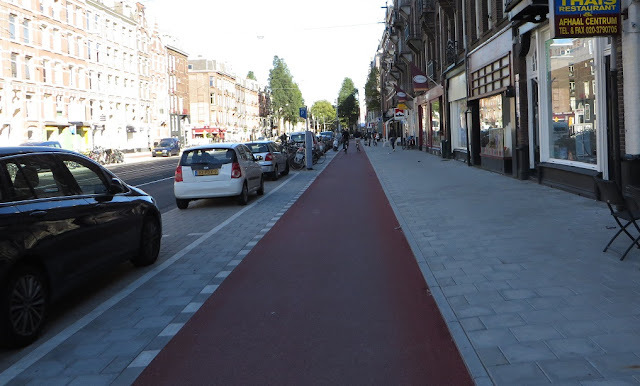 However placing the loading bay in the cycle track is a bad idea as it will force cyclists to swerve into the carriageway to get past. 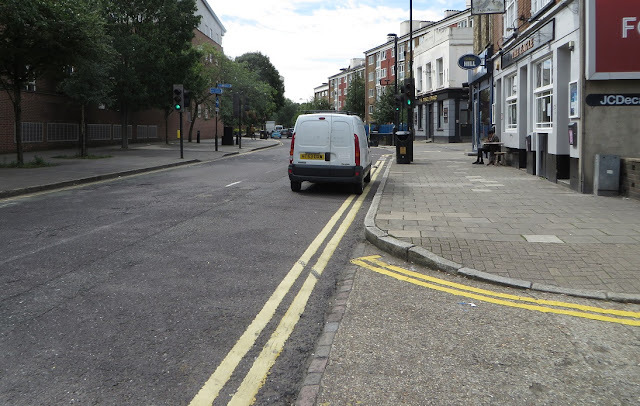 I would argue that there is no need for a loading bay here at all, there is just one pub and a Chinese takeaway here. 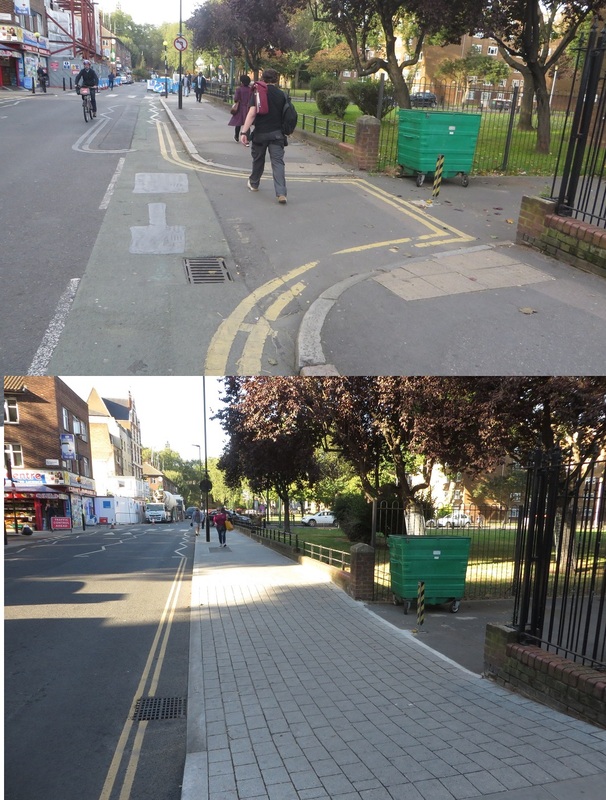 There is a loading bay on Wick Road on the other side of the junction, less than 40 metres away, which could be used instead. This is the loading bay the shops on Kenworthy Road have to use due to a narrow carriageway and they are further away from it than the two commercial premises here. 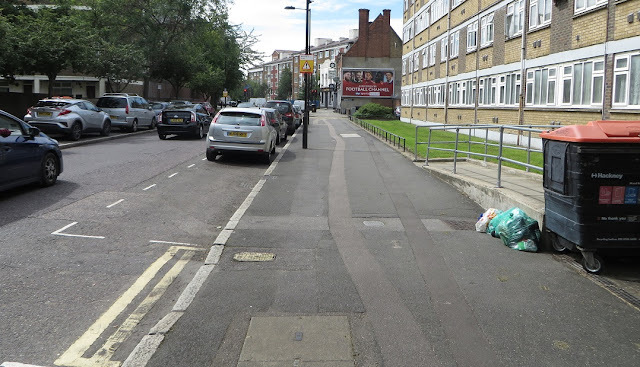 There is also the issue that the cycle track simply stops here and forces you out onto one of the busiest and most unpleasant roads in all of Hackney, the section of Wick Road that is a wide and fast dual carriageway, filled with traffic coming on and off the A12. 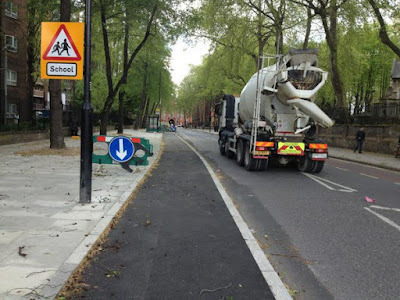 This is under the control of Transport for London so not much that Hackney Council can do here but they can do better than just give up. 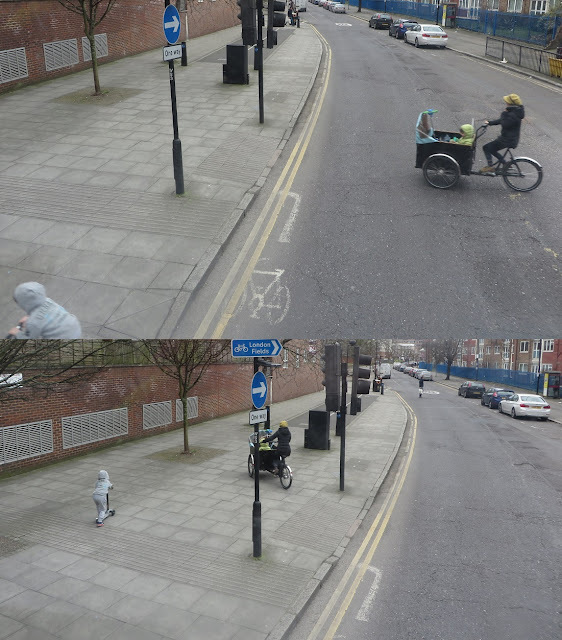 Personally I would prefer to see a toucan crossing at the end so people cycling can go into Brookfield Road to access Victoria Park. A longer term plan would be for TFL to construct a bidirectional cycle track from Brookfield Road to Chapman Road along the southern side of Wick Road where signalled pedestrian crossings already exist across the A12 slip roads. The pavement here is heavily used by cyclists already, for obvious reasons. 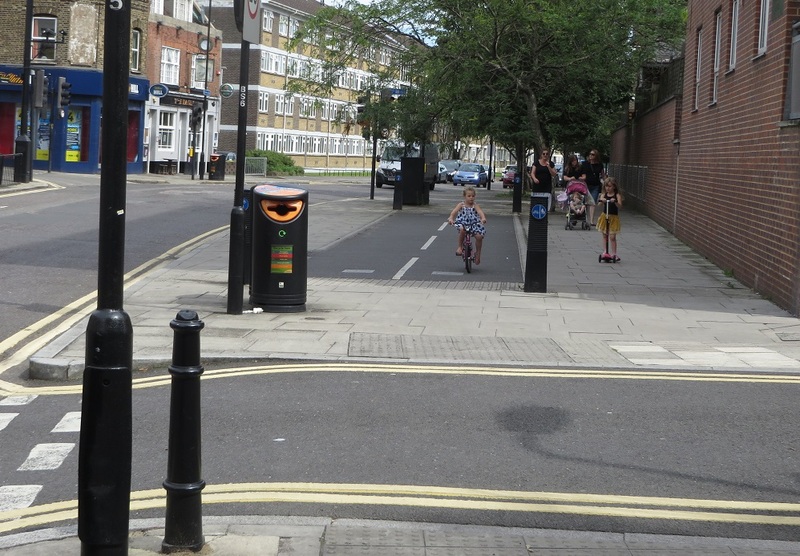 Meanwhile in this consultation I'm also a little disappointed in the provision for pedestrians as only uncontrolled pedestrian crossings are proposed, when zebra crossings should ideally be in place. 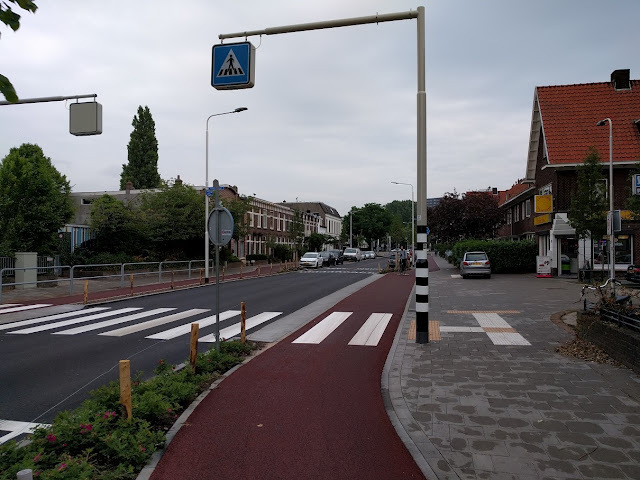 A zebra crossing on a road and cycle track in Nijmegen I used this summer. I had used this road almost exactly a year earlier and it was very unpleasant, with narrow painted cycle lanes in the door zone of car parking. This gives me hope that by next summer Wick Road can be a great road to walk and cycle on, if the reconstruction is as good as this. I'm also a little concerned that not enough is being done to tackle speeding on Wick Road. 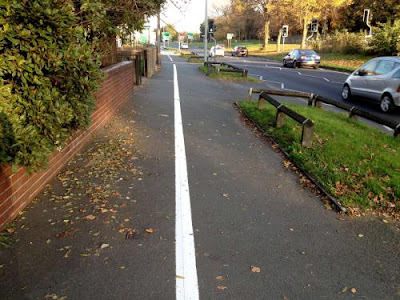 The council state that in a recent traffic survey the average speed of traffic here was 28mph, despite the huge "20" signs painted onto the carriageway. Indeed whilst I was walking along this road to take photographs some cars were going significantly faster than that. 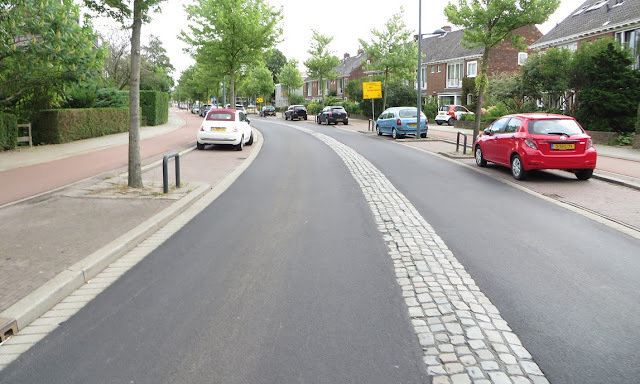 Many roads in the Netherlands employ this central strip in the carriageway to keep traffic speeds down, could this treatment be possible on Wick Road? Ensure the cycle track is machine laid with smooth asphalt, of a contrasting colour, and a minimum of 2 metres wide wherever this is possible. The footways and cycle tracks should be continuous past the side roads, estate roads leading to car parking and the entrance to St. Dominic's Primary School. 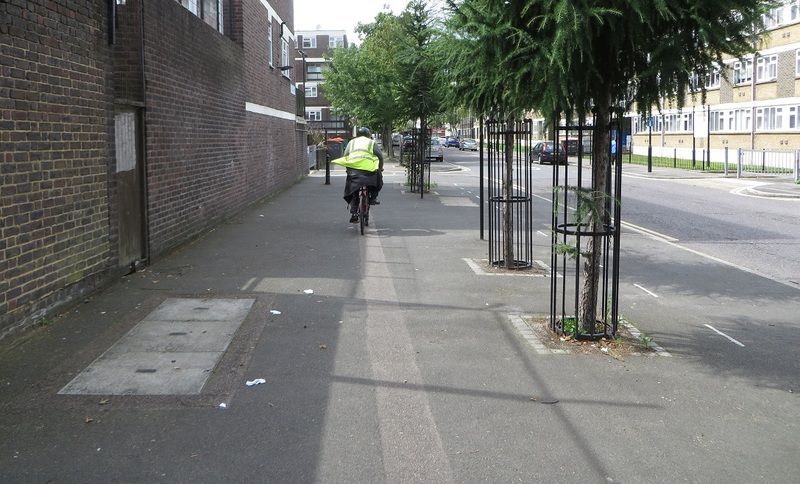 There should be no obstructions on the cycle track. If it is decided that speed bumps are needed (such as at the bus stops) then they should be as smooth as they would be on the carriageway alongside. 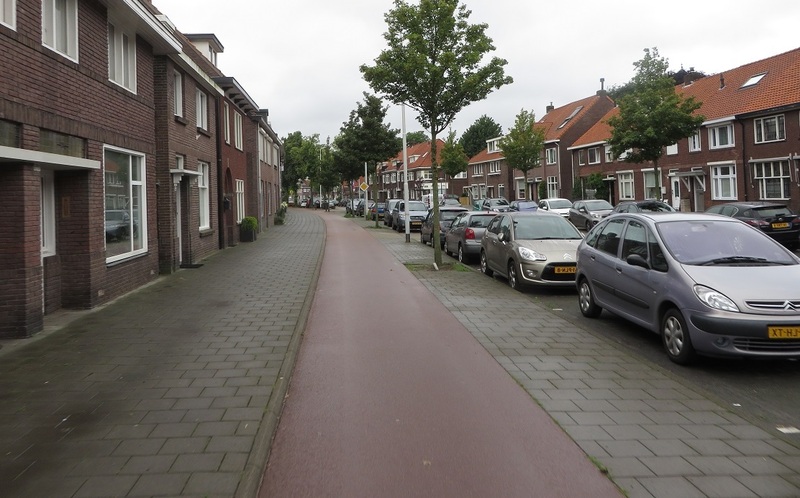 More residential roads in the surrounding areas should be filtered to reduce motor traffic and encourage people to walk or cycle instead. This also ensures children living on streets nearby could access Wick Road safely by bike. Rachel Aldred has also written about this scheme here, here and here.